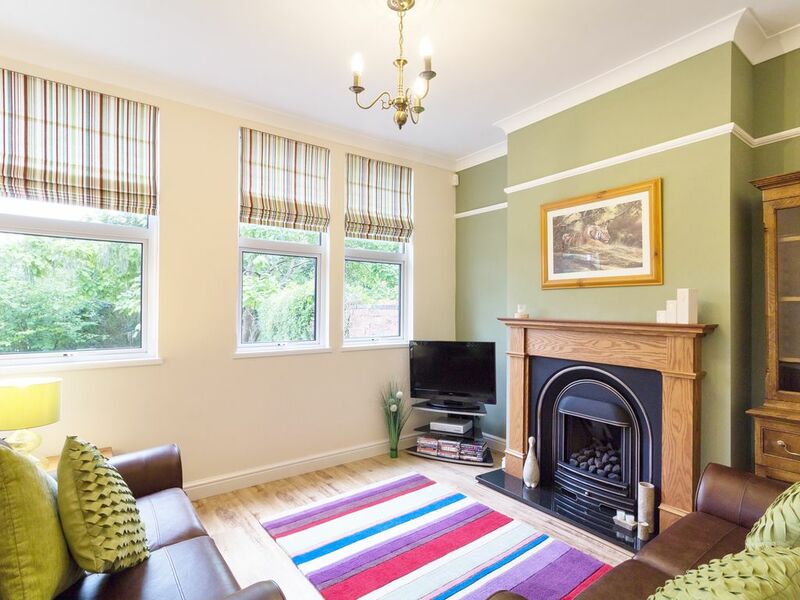 This charming semi-detached cottage resides in Highley, Shropshire and can sleep six people in three bedrooms. The Elms is a well-presented semi-detached property resting in the village of Highley, in Shropshire. It comprises three bedrooms; a first floor king size and double rooms, one second floor king size double, sleeping six guests altogether. Inside is also a ground floor wet room with walk-in shower, kitchen, utility, first floor cloakroom, dining room and two sitting rooms. Outside is ample off-road parking and a south-facing garden with lawn and gravelled area with seating. The Elms is a delightful cottage in the heart of a wonderful region of England. Amenities: Oil central heating, underfloor heating in large lounge, kitchen and dining room with gas fire. Gas hob, electric oven, fridge/freezer, microwave, dishwasher, washing machine, TV/DVD, WiFi, selection of books and DVD's. Fuel and power inc. in rent. Bed linen and towels inc. in rent. Ample off-road parking. Lawned garden with gravelled area and patio with seating. Sorry, no pets and no smoking. Shop 1 mile, pub 5 mins walk. Note: the property staircase is steep, please take caution. Please note this property has a good housekeeping bond to the value of £100. Town: Highley is a large, charm-filled village located on the west bank of the River Severn in Shropshire. Boasting pubs, cafes, take-aways and shops, this illage provides everything you might need for a comfortable holiday in Shropshire. It rests on the famous Severn Valley Railway offering walking, wildlife, local history and quiet places to relax. Within easy drive is the market town of Bridgnorth with castle ruins, riverside walks, country parks, impressive houses and museums, in and around the area. Worcestershire and The Cotswolds are further afield. Three bedrooms: 1 x king size double, 1 x double, 1 x second floor king size double. Ground floor wet room with walk-in shower, basin and WC, first floor cloakroom. Kitchen. Utility. Dining room. Sitting room. Second sitting room. Oil central heating, underfloor heating in large lounge, kitchen and dining room with gas fire. Gas hob, electric oven, fridge/freezer, microwave, dishwasher, washing machine, TV/DVD, WiFi, selection of books and DVD's. Fuel and power inc. in rent. Bed linen and towels inc. in rent. Ample off-road parking. Lawned garden with gravelled area and patio with seating. Sorry, no pets and no smoking. Shop 1 mile, pub 5 mins walk. Note: the property staircase is steep, please take caution. Please note this property has a good housekeeping bond to the value of £100.